What is the Toronto Stock Exchange? • The Toronto Stock Exchange, based on market capitalization, is the largest stock exchange in Canada, the third largest in North America and the seventh largest in the world. The Toronto Stock Exchange is owned by the TMX Group; the exchange is operated as a subsidiary of the company. • The Toronto Stock Exchange is home to a number of companies from Canada, the United States, Europe and other nations throughout the world. In addition to conventional stock listings, the Exchange features a number of exchange traded funds, investment trusts, investment funds and split share corporations. 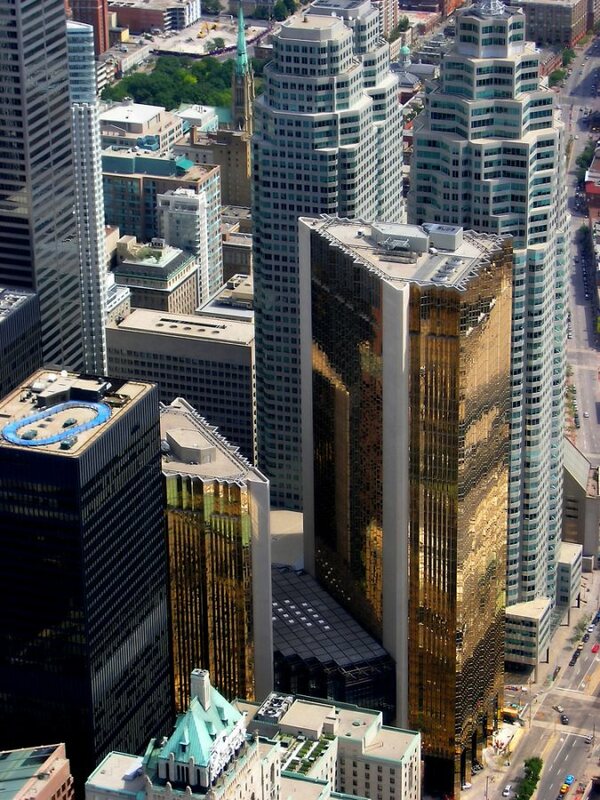 Furthermore, the Toronto Stock Exchange is regarded as the global leader in the mining, oil and gas sector—more mining and oil & gas companies are listed on the Toronto Stock Exchange than on any other market in the world. • The Toronto Stock Exchange was informally created on October 25, 1861, when twenty-four business men gathered at Masonic Hall to officially create a marketplace, where they can buy and sell rights to corporations. When the meeting place grew in size, the exchange was formally incorporated by the Legislative Assembly of Ontario in 1878. • Following government recognition, the Toronto Stock Exchange exponentially grew in size and the number of shares traded. In 1934, the Exchange merged with the Standard Stock and Mining Exchange—a key competitor. The merger kept the name, the Toronto Stock Exchange, and an automated trading system was incorporated, to be used for the quotation of poorly liquid equities, in 1977. Once the Toronto Stock Exchange incorporated CATS (Computer Assisted Trading System) the market shut down its trading floor, making the Toronto Stock Exchange the second largest stock exchange on the continent to operate solely in a virtual trading environment. • In 2000, the Toronto Stock Exchange officially became a for-profit company; 11 years later, in February of 2011, the London Stock Exchange merged with the TMX Group to create a combined entity that featured a market capitalization of nearly $6 trillion dollars. This deal; however, has not been finalized as numerous rivals are offering bids in hopes of blocking the merger. • The Toronto Stock Exchange operates under a normal trading session from 9:30 am to 4:00 pm ET; the market has post-market trading sessions that go from 4:15 pm to 5:00 pm ET on all days of the week except weekends and holidays declared by the Exchange. • As of January of 2011, the Toronto Stock Exchange has 1,498 companies listed with a combined market capitalization of over $2 trillion dollars. The Toronto Stock Exchange lists all of Canada’s premiere commercial banks, including the Bank of Montreal, Bank of Nova Scotia, Royal Bank of Canada, the Toronto-Dominion Bank and CIBC. In addition to financials, the Toronto Stock Exchange lists a number of primary energy companies including: Husky Energy Inc., the Cameco Corporation, Canadian Natural Resources Ltd, Canadian Oil Sands Trust and the EnCana Corporation.